The driver from Padova has been unbeatable on the Mygale of JD Motorsport at the Austrian circuit. Cheever and Maisano complete the podium on the Dallaras of Prema Powerteam. 04/08/2012 - Agostini - Red Bull Ring, this seems to be a winning couple. At the Spielberg he put his name on top of the charts of free practice and in the box of the winner of race one, setting also the fastest lap of the race. Agostini, after a moment at the beginning in the formation lap when he managed to leave his spot only right before Kuroda, managed to line his car up in the pole position even if he was not brilliant at the start. The strength of the driver from Padova emerged since the end of the first lap when he was already on top of the race. Behind him, Eddie Cheever managed to stay close to the Italian but after turn one the unbearable rhythm of the rookie started and games stopped there. The Roman driving for Prema Powerteam accused a gap of 11 seconds at the chequered flag, ending 2.8 seconds ahead his team mate Brandon Maisano. Right at the feet of the podium was the third driver of Prema Powerteam, Henrique Martins, who produced a good race ahead of Kevin Giovesi, on the Dallara of team Ghinzani, at his second participation in the championship but managing to get a good margin to the returning Patric Niederhauser. The Swiss of team BVM had to fight for most of the race against Nicholas Latifi, the Canadian racing with JD Motorsport who started in third position and ended seventh. Latifi run an unlucky race; in fact, right after the start he went wide into the grass and lost a few positions having to run a steep race from there on. Eighth at the flag was the driver from Moscow of Euronova, Sergey Sirotkin who proceeded his team mate Yoshitaka Kuroda. Robert Visoiu (Ghinzani) and Mario Marasca (BVM) went out due to a contact when fighting for the sixth position. 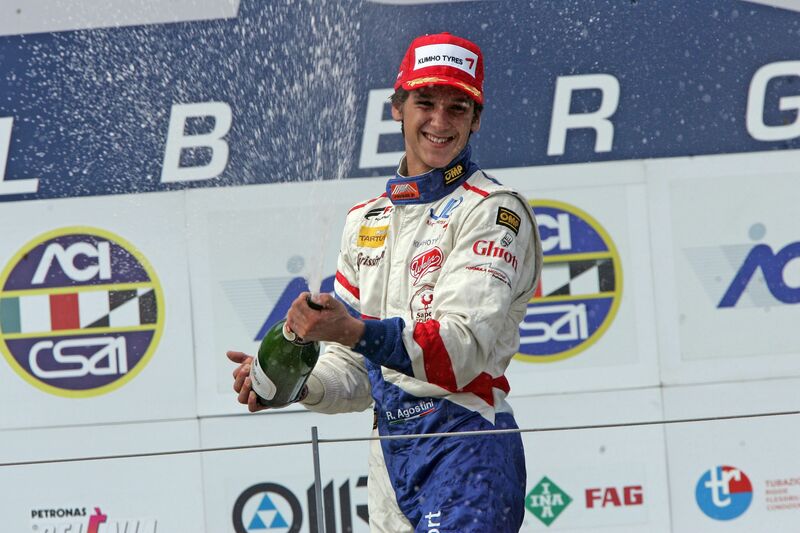 Eddie Cheever is still leading the Italian Formula 3 European Series with 173 punti, Maisano follows him at 154, 13 points clear of Riccardo Agostini. In the Italian Series Maisano has the same score and Cheever follows at 101 points, Agostini is third at 82. The sprint race on 15' plus a lap will start tomorrow at 10.20 (GMT+2) with live coverage on Rai Sport 2. Patric Niederhauser will start from the pole position with Kevin Giovesi at his side (Ghinzani). The second row will be all-Prema Powerteam's with Henrique Martins ahead of Brandon Maisano. The race closing the weekend at Red Bull Ring will have green flags at 16.35 and Riccardo Agostini will have the chance to use the pole position to get closer to the top of the classification.